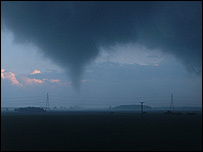 A mini tornado has left residents clearing up debris after it struck on Monday evening in Lincolnshire. People watched as the twister tore off roof tiles and picked up and carried rubbish across the Sleaford area. Eyewitness Paul Golthorpe, from Finch Hatton Close in Ruskington, said he had never heard the wind make such an horrendous sound. A trampoline was also seen by some eyewitnesses flying down the street after it was picked up by the tornado. Mr Golthorpe said at first he had no idea what was causing the noise outside. "We thought it was some low-flying jets but then the house started to shake a bit and I looked out of the window and saw lots of debris in the road," he said. BBC weather presenter Jim Gould said the tornado was small-scale but significant. "On Monday night the air destabilised and heavy showers developed with a large quantity of air in vertical motion. "Some of the air was moving upwards and some downwards at which point various physical forces take over and adds a certain amount of spin - creating the rotational characteristics that were seen in Ruskington." Do you have any pictures of the tornado? If so, you can send them to yourpics@bbc.co.uk . Do not endanger yourself or others, take any unnecessary risks or infringe any laws. I was fishing near Legsby. It was getting rather dark when I noticed an unusual cloud formation from ground level to about 100ft (-ish) high. It seemed to start as a column of about 70-100m wide, then grew larger in width, then disapeard in rain. I got home and my dad told me of the report on Look North about a tornado at Ruskington. Please, there is no such thing as a 'mini'-tornado, this phrase has been made up by reporters and it is way off the mark. A Tornado is a Tornado which is measured using a scale, not by 'mini' . I was there. I was driving home and just gone past Sleaford when i looked in my mirror and saw the tornado. I got home in one piece but had never seen something like that before in my time.